Image purchased from iStock. Text added by author. on my bike. Each of these elements is essential to drive the bike over various terrains. I think of myself as the motor (alas, not a Ferrari motor), and these components are the fine tuning mechanisms which take me on my global travels, to the heights of Alpe d’Huez or smoothly along the Sandgate foreshore. It is the various terrains of Inquiry Based Learning (IBL) which I’ll be traversing in this blog, and reflection will provide the Cog-nition mechanisms for this rumination. prepare and sustain individuals on their 21st Century learning travels. By choosing the IBL road, I’ve achieved the dizzying heights of discovery and the all too rapid descent to disappointment during my research. However, the drive chain of my research has always focused on how I can provide best practice models across the various terrains (RTO regions) for teachers to develop and provide pertinent 21st Century learning experiences for their students. By sharing my IBL travel reflections, it is my intention to demonstrate how IBL can assist me to create transitional pathways for RTO LLN teachers and achieve the outcomes noted above. 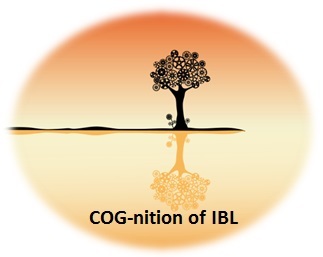 IBL Cog-nition componentry can be located in various theoretical models as demonstrated in Figure 1. For this activity I have adopted Kuhlthau et al’s Guided Inquiry Design Process (2012) as the reflective framework for my IBL travels to date. Considering the similarity of the elements of each model, I believe Kuhlthau et al’s model clearly defines the phases I have experienced, and demonstrates the transformative experiences of my inquiries and learning. Phases of this model tend to be cyclical rather than linear, and the connectivity of the reflective process scaffolds the movement and progression between phases. employed reflection to assist me to translate outcomes into examination of the inquiry questions and future inquiries. Application of these components has contributed to the clarification of theoretical background, models, scaffolding, tools, learning domains, types of learning, international and national positioning of IBL and Information Literacy (IL), and highlighted the need for a collaborative approach when implementing IBL into classroom practice or professional development workshops. The latter point draws attention to the interface which exists between current practices and those I employ to disseminate IBL methodologies for the RTO’s LLN teachers. Stimuli or starters for the two initial phases – Open and Immerse – have been supported by the availability of online course material and the informative and relevant weekly webinars. These resources provided stimuli to progress to the Explore, Identify and Gather phases of my research, and I hit the road with an elevated cadence as I began the Explore phase. Sustainable? NO! The volume of information on the internet is overwhelming (Kuhlthau et al, 2012, p.3), and locating reputable sources is highly problematic. To address this problem I employed Boolean Operators in my search parameters. Locating instructional web pages and videos guided me through the effective implementation of these operators. Did my research skills improve? The short answer is “Yes!”, and, I believe this was the direct result of combining the instructional material and isolating topics, themes and key points in mind maps. Once I had located material, I required criteria to isolate relevant and reputable literature from the search results. To this end, I conducted a Google Scholar search – criteria for evaluating scholarly articles – and located an article, “Evaluating Internet Research Sources”. This article discusses the “CARS (Credibility, Accuracy, Reasonableness, Support) checklist for Information” (Harris, 2013, p.3). Before employing this checklist to ascertain reliability of sources, I completed a Google search on the author and online journal – Dr Robert Harris AND Virtualsalt – and the biographical results reassured me of the reliability of this resource. CARS provided valuable support during the Immerse, Explore and Gather phases. practice, learning domains and available tools. It was at this stage I formulated my initial three questions (Figure 2) founded on my current work objectives and personal philosophy which is embedded in Constructivist Theory. My main focus for the Explore phase was locating relevant resources to articulate a concise definition of IBL and to improve my online search skills. I searched several databases for this phase (captured in my blogs, “The Million Dollar Question – What is Inquiry Based Learning?” and “Searching! Unpacking!”), and recognised that Information Literacy would be a valuable scaffolding element to assist LLN teachers and learners engaged in IBL. At this stage I rephrased my first question to address this argument – Will collaboratively introducing Information Literacy (IL) into LLN classrooms, actively engage and support learners to develop lifelong learning habits and skills? Reflecting on the modification of this question, I considered whether narrowing the focus would in fact achieve the desired outcomes. I discussed this issue with colleagues (several teachers and a librarian), whom I am currently working with to implement a guided inquiry model, and they provided feedback to support the introduction of IL as both integrated and specific tasks during class sessions. Informal feedback from learners has indicated this has been a positive approach. surrounding the Alexandria Proclamation On Information Literacy and Lifelong Learning’s definition of IL and Bruce et al’s argument supporting informed learners access to multiple tools to source, process, control and construct knowledge (2012, p.529). Reflecting on information in Jacobs’ article clarified the fact I had limited knowledge of IL standards and the history of proposals at international and national levels which nominate the IL abilities and suggest policy terms to support learners at all levels of education as they navigate our information heavy society. Accessing the Alexandria Proclamation (Garner (ed.) 2006), document provided valuable insight into the current and projected directions for IL within various domains e.g. education and health. On the other hand, Bruce et al’s article had me aligning the elements of the Experiences of Informed Workers (p.530) to the Commonwealth Government’s Core Skills for Work policy and considering strategies for integrating this framework into professional development sessions for LLN teachers. 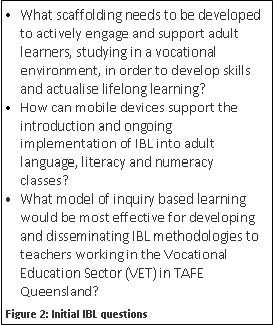 This article also prompted me to rephrase my second question to – What tools will support the introduction and ongoing implementation of IBL into adult language, literacy and numeracy classes?. I continue to acknowledge mobile devices would be the most readily available tool for most learners in the RTO’s LLN classes, however, there are multiple tools across various domains e.g. education, personal and work, which individuals need to access in order to create their knowledge. The Open, Immerse, Explore, Identify and Gather phases are like a Criterion race, where you are constantly engaged with the context of the event by observing, considering the environment, participants, conditions and above all, maintaining focus. However, the bell lap strongly relates to the Create phase of Kuhlthau et al’s model, as you have only one goal in mind, creating a powerful and exciting finish. The analogy of this race to the model’s phases is highly evident to my cycling COG-nition, particularly at the Create phase. Building a powerful and exciting finish, in this instance blogs, requires acute focus on engagement and context. The Create phase clearly demonstrates the cyclical nature of IBL and Kuhlthau et al’s Guided Inquiry Design Process, as you need to establish a context which provokes readers’ curiosity as this element is a main goal of the Open phase (Kuhlthau, 2012, p.3. Dewey, 1910, p.33). Conflating information derived from multiple sources, and presenting evidence and discussions to support my arguments in an academic, yet highly readable and engaging style, has been a challenge. A challenge I have found exhilarating and at times confounding. Undertaking this reflection as a mechanism of the Evaluate phase I can clearly delineate the directions I have taken e.g. Information Literacy, lifelong learning and learning domains, on my IBL travels. By employing Kuhlthau et al’s model as the reflective framework for the Evaluate phase, I recognise areas I need to continue to address e.g. my online research skills, and the enormity of the topic itself. I have reviewed in excess of seventy articles and books to date and have only just commenced this cycle of learning. From these reviews I acknowledge I need to employ the CARS information checklist more rigorously in future research. I mention this with regards to Kathryn Leong’s article, Information Literacy and TAFE: challenging librarian and teacher collaboration in the VET sector in a TAFE Institute. Locating an article which specifically referred to IL and TAFE clouded my judgement about its relevance. There are still many roads to explore e.g. Informed Learning within various contexts, however, this reflection, if nothing else has demonstrated my blogs present a clear picture of roads and strategies for COG-nitating Inquiry Based Learning. Bibliography blog – “Searching! 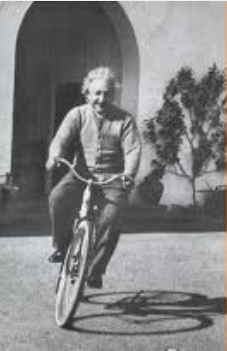 Unpacking!”, and again I’ll leave the last word to Herr Einstein to explain when he developed his theory of relativity. I invite you to experience the Evaluate phase by visiting www.iblqutmmh.com and leaving responses to assist me with my future research cycles. Dewey, J. (1938). Experience and Education. MacMillian, New York. Kuhlthau, C., Maniotes, L.K., Caspari, A.K,. (2012). 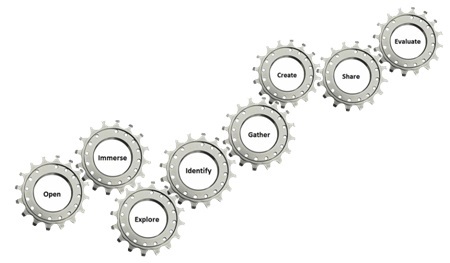 Guided inquiry design: a framework for inquiry in your school. Libraries Unlimited, Santa Barbara, US. Harris, R. (2013). Evaluating Internet Research Sources. VirtualSalt, December 2013. Retrieved from http://www.virtualsalt.com/evalu8it.htm August 11, 2014.